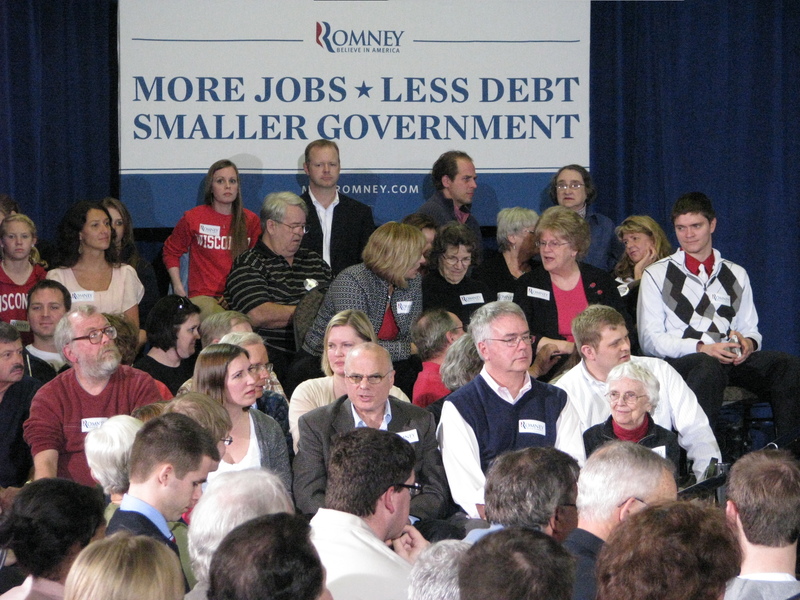 But not to worry; as Romney concluded his answer to the gentleman’s question on how to persuade women that things such as “more jobs, less debt and less government are women’s issues,” he reassured American women they have nothing to fear: “…this was not a matter of contraceptives… the Republican Party of course is not in any way gonna ban contraceptives.” But he’s not saying they’re planning to provide national healthcare coverage for them either. Click here for a story about what was happening outside the hotel. I “infiltrated” this town hall, and I did preregister to be there, but they barely looked at my ID and the person with me was not on the list and they barely looked at that ID either and they let us in. Of course, I did my best to look “republican” and didn’t take out my anti-Walker buttons and headband until the town hall had started. Time well spent in the belly of the beast. I “infiltrated” this town hall, and I did preregister to be there, but they barely looked at my ID and the person with me was not on the list and they barely looked at that ID either and they let us in. Of course, I did my best to look “republican” and didn’t take out my anti-Walker buttons and headband until the town hall had started. What a liar Mint Rmoney is. Poll after poll shows the deficit is way down on the list of people’s concerns. Mint is SO in touch with the people, isn’t he? It’s pathetic that multimillionaires like him and lyin’ Ryan are so worried about the debt while so many are one medical emergency away from bankruptcy. I loathe them..